This post is OUTDATED. 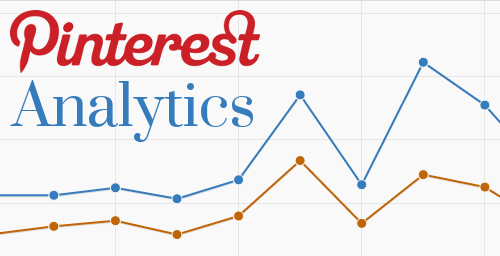 In August 2014, Pinterest completely revamped and significantly improved their analytics. An overview of the new analytics is available on the Pinterest Business blog in this post: How to use Pinterest Analytics to change the way you Pin. 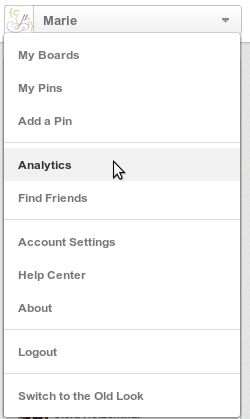 It's been a long time coming, but Pinterest has finally released analytics! If you have a verified domain on your Pinterest account, you can now track stats for Pins from your website. Verify your website with Pinterest. Pinterest needs to know what site you own before they can show you the analytics! If you blog on Blogger, Wordpress.com, or Tumblr, you can find instructions for verifying your site here. If you're on self-hosted Wordpress, use Pinterest's meta tag instructions here. Switch to the "New" Pinterest, if you haven't already. When you log into your Pinterest account you'll be asked if you'd like to switch to the new look. Switch over and you'll be all set to check out your analytics. Once you're verified & switched to the new Pinterest look, you can reach your analytics page by clicking on "Analytics" in the user menu dropdown at the upper right of the page. The first page you'll see in Pinterest analytics is the Site Metrics dashboard. There's quite a bit of data there, so let's break it down. By default, the site metrics show you the past 14 days worth of stats. You can change the date range by using the datepicker to the left. You can quick select 7, 14, or 30 days, or you can select your own date range from the calendar. Stats go back to your original verification date (November 1, 2012 at the earliest). The four graphs on the Site Metrics page all have the same format — in the box to the left, you'll see a daily average of each metric, and in the graph to the right you'll see the actual daily stats from which the averages were derived. This shows the count of Pins from your website and how many individual people ("Pinners") Pinned something from your site. This shows how many times Pins from your site have been repinned, and how many people made those repins. Keep in mind, this is not a measure of repins of your Pins — it's repins of Pins from your site. This metric is very different from the first two stats, and it was the most elusive, until now. Impressions & Reach show you how many people are seeing your Pins, even if they didn't click on them. As Pinterest has described this metric, it seems that it measures impressions and reach of your Pins, not just Pins from your site. "Impressions" shows how many times your Pins showed up on the main page, in search results, or on people's boards. The "Reach" shows how many people "saw" your Pins in their feed. Whether or not they actually looked at them can't be measured, but you can at least know that your Pins were on their Pinterest page. If you track Pinterest visits in Google Analytics, you already have access to this information, but it's always good to have more than one source! "Clicks" shows you how many clicks went to your site from Pinterest. "Visitors" shows the number of individual people Pinterest sent you. These three options are fairly self-explanatory; they let you see the most recent Pins from your site, the most repinned, and the most clicked in your date range. 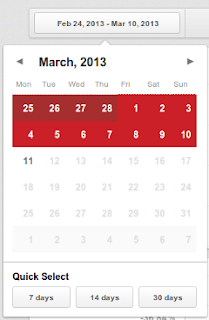 By default these are set to a one-day range, but you can use the datepicker to set a longer date range. Go Check Out Your Stats! You're all set to get the most out of your Pinterest analytics. Get in there and do some digging; you'll learn a lot about what your readers love about you, and you can use that to give them even more to love!